Messages of celebrations were shared across the country on Wednesday to celebrate the 87th Saudi National Day. His Highness Sheikh Mohammed bin Rashid Al Maktoum, Vice-President and Prime Minister of the UAE and Ruler of Dubai, took to Twitter to congratulate the Saudi people on the occasion that falls on September 23. "Congratulations to our brothers in KSA on their 87th National Day; our countries share a cherished partnership and their joy is our joy," he said. "#Always_Together, the kingdom and UAE. Their pride is our pride, their country is our country, and their kings are the pride of us all. We will always be together in fate, the service of Islam and in defence of our countries. The joy of the kingdom on the National Day is the joy of UAE and its people. "May God bring glory on the Custodian of the Two Holy Mosques and his Crown Prince," Sheikh Mohammed tweeted. Dubai launched a new logo celebrating the 87 years of Saudi Arabia designed with #Always_Together, the hashtag was the top trend on social media platforms. 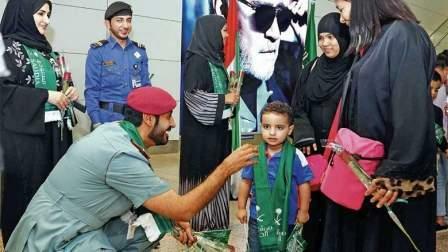 Saudis arriving to the UAE were welcomed at Dubai airports with flowers and Saudi flags. Officials at the airport wore scarves representing the Kingdom of Saudi Arabia and immigration counters were decorated with Saudi flags. Saudi arrivals received a new type of passport stamp of the logo that said #Always_Together and mascots were seen giving out flowers. The control tower of Abu Dhabi Airport was also covered with the Saudi flag. The Dubai Police used the #Always_Together logo on their supercar patrols and social media accounts. Major-General Abdullah Khalifa Al Marri, Commander-in-Chief of the Dubai Police, said the gesture was to confirm the deep brotherly relations between both countries and their historical ties. He noted it is also to celebrate the Kingdom's role and vision in various situations that underlined the depth of its Arab identity and showed its keenness to protect the Arab nation's acquisitions while addressing the challenges lying ahead. The UAE has been celebrating strong ties with Saudi. Last year, Al Sufouh Street was renamed after the Custodian of the Two Holy Mosques, His Highness King Salman bin Abdulaziz Al Saud of Saudi Arabia, on the occasion of the 86th Saudi National Day. Malls and popular family attractions in the emirate also joined the celebrations by hosting events and activities including a Saudi National Day show, a unique Imagine show and a Lego Bricks Festival at Dubai Festival City and the distribution of Saudi national flags to visitors at Dragon Mart 2. Saudi National Day commemorates the establishment of the Kingdom of Saudi Arabia and unity of all its regions under the same name by King Abdulaziz in 1930. It is celebrated with folklore dances, songs and traditional festivals. Saudi Comedian Fahad Albutairi has been living in the UAE for almost a year. Feeling welcomed from the first day, Albutairi said he never felt he had left home. "I don't feel I'm out of place because of the extreme similarity between both cultures. The UAE has found perfect formula that combines aspects of deep cultural roots and identities, specifically GCC traditions." He said the UAE's celebrations are "very heartwarming" and reflect the strong ties between the two nations and peoples.